We travelled all over the world visiting lots of Hostel, and we think to know what are necessity of our guests. We work hard to make you feel welcomed, and we want to make you fall in love with Bologna. We speak English, Spanish, Italian, French, Dutch, German, Arabic, Romanian and Greek. How do you care about an hostel feel? 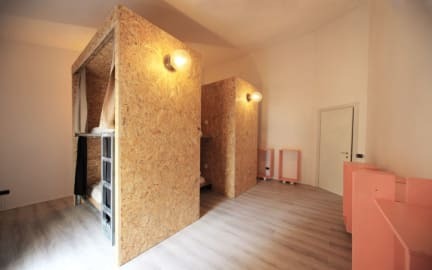 Dopa Hostel furnishing has been built up 99% handmade inside an old and fascinated building of Bologna downtown, using mainly wood and iron. Almost any piece was designed and carried out with love, using relaxing colours, respectful of Dopa logo and mission. Dopa Hostel wants to be an home more than an accommodation, where guests could feel a warm sensation just from their pass in. Dopa Hostel is an harbour. Dopa Hostel is the only downtown hostel of Bologna. Located in the worldwide famous Universtiy area of Bologna (the first university of the world), Dopa Hostel is surrounded by historical Bologna's building just 10 minutes walking distance to all its historical point of interest, like Piazza Maggiore (Maggiore Square), Torre degli Asinelli (Asinelli Tower), MamBo (Contemporary Art Museum), Palazzo Fava (Fava Palace), Palazzo Albergati (Albergati Palace). In just 10 minutes walk you can also reach Bologna Stazione Centrale train station (where you can also take a bus to Marconi Airport), and Stazione Autolinee bus station. Dopa Hostel is located in one of the most vibrant area of Bologna, where nightlife goes on 24/7. You'll find lots of restaurant, live music club, cocktail bar, pub just in our surrounding streets, and you can spend your time going shopping on famous Via Indipendenza, or getting lost in one of the medieval streets of Bologna city centre. If you ask our reception, we'll be a pleasure for us to give you usuful tips, update on events and info about transportation. Are privacy and safety important for you? We do. At Dopa Hostel we really have special big bunk beds, made up with wood and iron, where any guest do not just have a bed, but he get a real private space, thanks to the closable curtain. You can spend less, sleep with other people, but creating your own space! Every guest has his own private cabinet, clothes hanger, locker with electricity socket inside and bed-light. Every rooms have private keys to improve safety. It's also possible to leave a luggage in our luggage storage for free. Do you want to spend less but have more? Italy just offer lots of things to do and lots of venues to visit, but sometimes it may be a bit expensive and not easy to move through. Check in from 12:00 to 23:00 (even after 23:00 if arranged in advance). Tourism tax not included - 0.50 EUR per person per night. Really cool hostel. Staff were super friendly. Rooms were clean and had everything I needed. Showers, kitchen. Common area and WiFi were all great. Everything about this place is wonderful. An atmosphere designed to meet other people with a really tight-knit feel in the living room and kitchen areas. Don't worry, if you want to keep to yourself, the bunks have curtains. The staff and location are wonderful as well. Loved this hostel! In a great location, great vibe, the staff was super helpful and friendly, and the breakfast was great. Only complaint was that there are only 3 bathrooms so in the morning I had to wait a bit. Other than that it was wonderful! Amazing!!! Seriously Super clean and friendly! The curtain idea gives you 100% privacy. And maybe the sweetest thing was that there is almost nothing from Ikea!! Dopa Hostel was located very close to the main sites. The staff was friendly and everything was clean and safe. They provide lockers with keys for you. But the best part was meeting people at the hostel. Great atmosphere and made traveling alone not so lonely. Great hostel. I preferred the 12+ bedroom compared to the 4 bedroom though. Much more spacious living quarters. Excellent kitchen and location. A straight 10 out of 10 for this Hostel. Great vibe, nice staff, beds are perfect with individual sockets, light and curtains. A lively street with bars is just one block away and the city center and University district is just a couple of minutes on foot. Only inconvenience might be the small number of bathrooms/showers. Great hostel. Nice and spacious. Lovely evening meal put on by staff too and free coffee and tea. Only 3 shower rooms - so can be waiting / but they are big and clean - so worth the wait! A bit of a walk into the centre each day (10-15 mins). Overall, great stay.